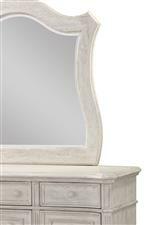 Add relaxing elegance to your bedroom with this queen sleigh bed. 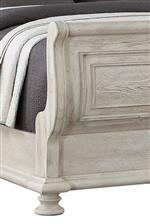 The scrolling shape of the headboard and footboard are complimented perfectly by the turned bun feet seen in the footboard. 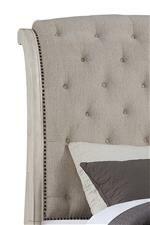 The button tufted upholstered headboard creates a sense of dignity and luxury in this bed, completing the traditional look and feel of the piece. The Barton Creek Traditional Queen Sleigh Bed with Button Tufted Headboard by Avalon Furniture at Simply Home by Lindy's in the Hickory, Morganton, Lenoir area. Product availability may vary. Contact us for the most current availability on this product. Create a space of elegant style and calming relaxation with this traditionally styled bedroom collection. Signature design features seen in the upholstered sleigh beds and the detailing on each storage piece create a sense of dignity and grace among the collection. Modern touches like USB charging ports, an LED night light, and hidden valuable storage bring modern ammenaties to these classicly designed pieces. 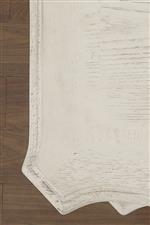 The Barton Creek collection is a great option if you are looking for Relaxed Vintage Transitional furniture in the Hickory, Morganton, Lenoir area. 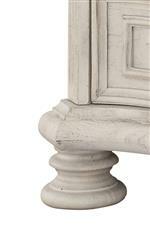 Browse other items in the Barton Creek collection from Simply Home by Lindy's in the Hickory, Morganton, Lenoir area.